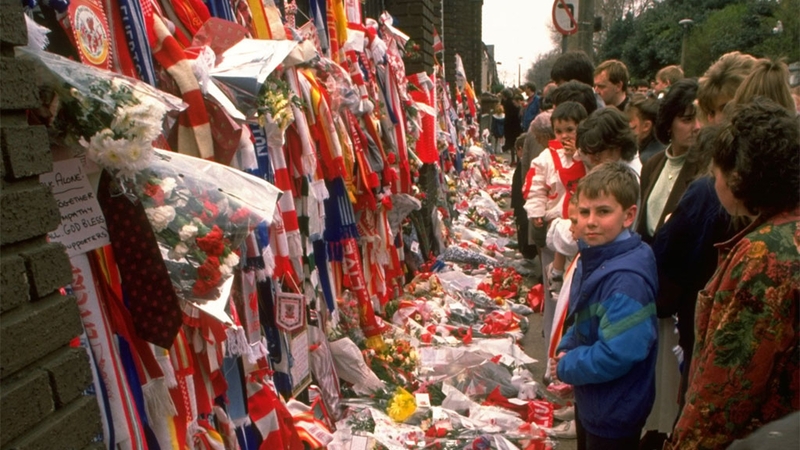 To mark the 30th anniversary of the Hillsborough tragedy, Rob Wright speaks to: Liverpool captain on the day Ronnie Whelan, Reds fan Peter Breen and RTE commentator George Hamilton, to build an oral history of that fateful day. 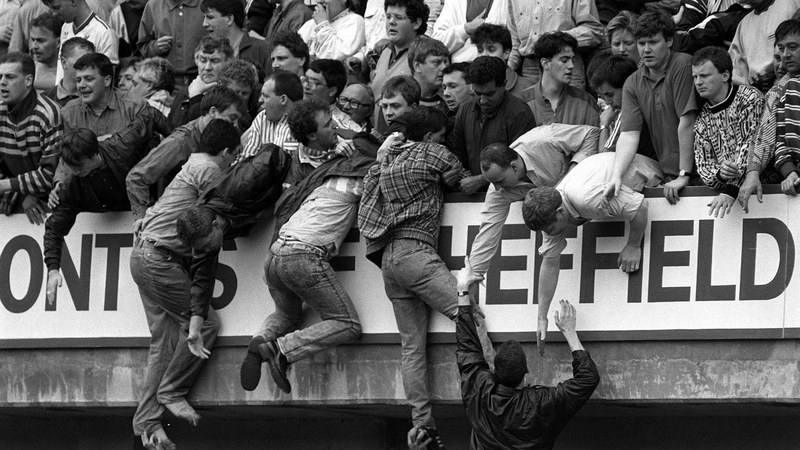 Today marks the 30th anniversary of the Hillsborough disaster, where 96 Liverpool supporters went to watch their side play Nottingham Forest in an FA Cup semi-final and never came home. 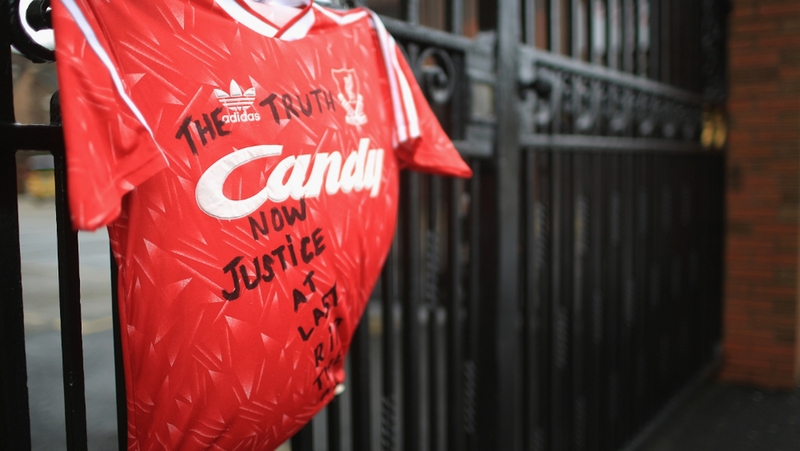 It is a tragedy that continues to this day, as family members and Liverpool supporters continue to seek justice, with court cases still ongoing. It was also an incident which affected everyone who was present and 30 years later we have spoken with three Irish people who were in attendance on that day. 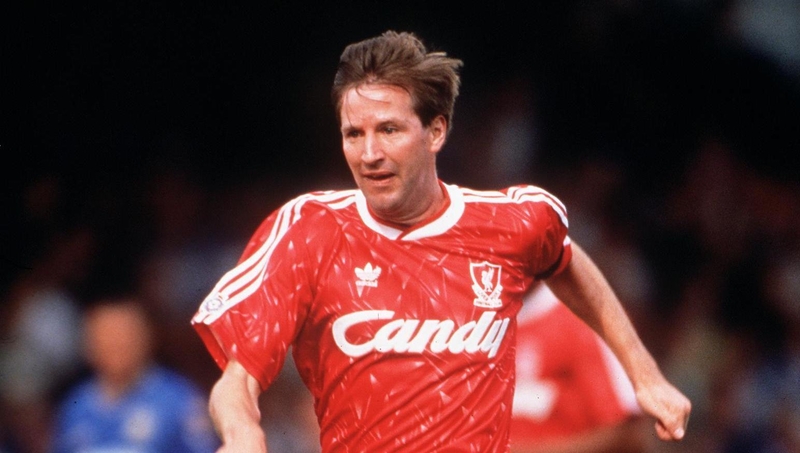 Ireland international Ronnie Whelan was the Liverpool captain and took a leading role off the pitch in the aftermath of Hillsborough. RTÉ commentator George Hamilton was in situ at Hillsborough on 15 April 1989 and reported throughout the live broadcast of the short-lived game, as the scenes that unfolded meant the match was quickly abandoned. Liverpool fan Peter Breen was nine years old when he made the trip to Sheffield with his father John and brothers David and Alan, before travelling to Scotland for the Scottish Cup semi-final between Celtic and Hibs. Here we relive that tragic day through the eyes of three people with very different perspectives: the player, the fan and the journalist. "It was just a normal day, there was nothing out of the ordinary, there was nothing weird happening. It was just everyone getting up in the hotel. "We all had lunch together and then it was the same as we'd always done for any semi-final or anything like that, we were on our way to the ground and that was it. "I remember 1981 or so when we got beaten by Chelsea in an FA Cup game and travelling to that game when we got stuck on the road going into Chelsea. There weren't police escorts then and it's always stuck in my mind that I was frightened to death. "I always remember that, but I cannot remember anything that happened on the way to the game that afternoon, there was nothing untoward. "People have asked the question for years and years, 'you must have sensed something?' We didn't sense a thing, even when we did the warm-up there was nothing going on, there was nothing that we could see, there was nothing that we could hear." "I travelled with David O'Hagan who was the producer on site that day. We flew over to Manchester on the Friday, stayed there and we hired a car. It was a beautiful spring day and we took the road over the Pennines. "It was a beautiful morning with quite a lot of traffic because that was the way the Liverpool fans would have gone as well. "We got to the ground in good time, parked up, went in and went about our business in the usual way. "We made our way to the commentary position, which was on top of the grandstand at Hillsborough. John Giles was with me as co-commentator, so we set ourselves up as usual about an hour before the kick-off, ready to go for a live broadcast into Sports Stadium." "We were on a supporters' bus with people who were obviously doing the same for the weekend. "It was a roasting day, I remember they stopped off at the bar as most adults do and we were on the bus with our crisps and coke, looking forward to an exciting game. "We were used to big crowds because of going over a lot and Dad was involved with Shamrock Rovers for many years in Milltown – there were a lot of big, high-profile games around that time, including the likes of Celtic. "So I was used to going to stadia and big events and not being intimidated, but this was very intimidating. It was really hairy that day, to the point that Dad took my brothers David and Alan in through one gate to the right of the corner where the Leppings Lane end was." "There must have been about three or four minutes when I couldn't find Dad, who had my brothers. That was around the 2:45pm mark and it was definitely hairy and hairy is a very crude way of putting it, it was kind of scary at that point because you knew there was something wrong. "We were in the corner beside the Leppings Lane end. Fans who had tickets were being guided towards the left but they needed to get into the Leppings Lane end and vice-versa and that caused a bit of confusion. It was like nothing else I'd seen before, it was very unusual." "It started as normal, there was no indication of anything untoward initially until what looked like, at first sight, a bit of crowd trouble, which sadly was not infrequent in those days. 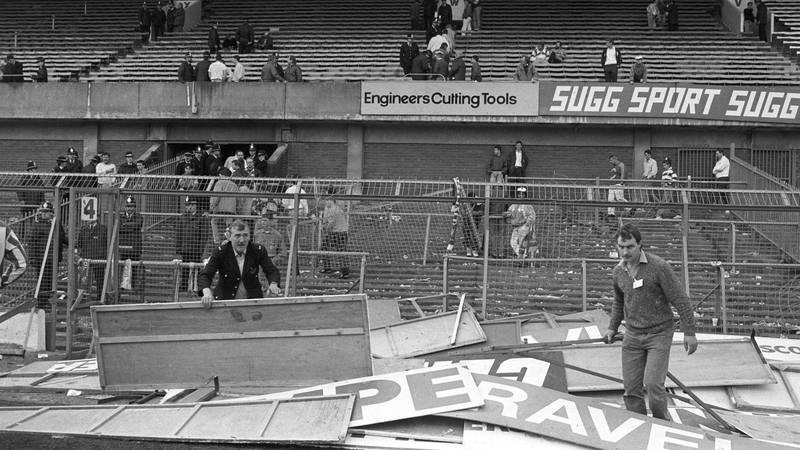 "But it became obvious that it was something very serious because there were people being hauled up from the lower terrace into the grandstand above behind that goal at the Leppings Lane end, and then the game was stopped with people spilling onto the pitch. "They asked up to keep broadcasting so we did and the players were then taken off the pitch. Then it rapidly deteriorated into the tragic scenes that we saw unfold before us." "It just got more gruesome as it went on. 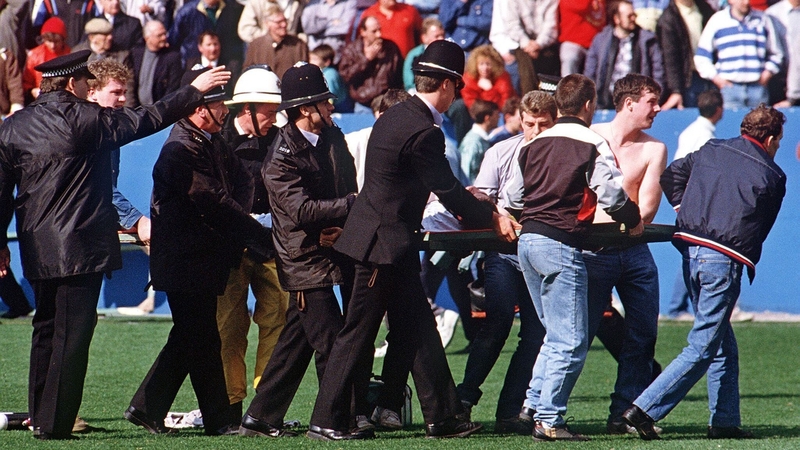 I have a couple of snapshots seared into my mind, the business of people being hauled up by the arms out of the crowd into the upper deck of that stand and then they started to carry people away on advertising hoardings. "They were old fashioned advertising boards and they were turned into makeshift stretchers. They were running diagonally across the pitch towards our right to where they could presumably take the people out to get them seen to because by then the ambulances had started to arrive and drove across the pitch. "The other thing that's seared in my memory is when I really realised what was going on. There was one of these advertising boards and there was somebody on it with a coat over their head and they were obviously dead." "It was mayhem, absolute mayhem because there was no disaster plan. People were just helping as best they could. "We were there on the top of that stand and we were still live on the air. David O'Hagan said he would go downstairs and try and find out how it was being dealt with and to get more information, while Giles and I kept going. The pictures were obviously telling their own story. "David came back some minutes later and he was as white as a ghost. He simply said 'there's a line of bodies lined up against the back wall of the grandstand', he'd gone down and that was what he'd seen." "We got to our seats. It was a big scramble getting there and trying to get up to them just before kick-off just through the sheer traffic. "Then the match went on for a couple of minutes, I think the only incident of note was Peter Beardsley hitting the crossbar. "The match was on Sport Stadium on RTÉ and mum and my two other brothers would have been at home and I think they were watching at home when it became very clear that there was a serious incident. "Dad had been at the Ibrox disaster in 1971 when there was a crush and he was also at Heysel, just by dint of being an absolute sports nut, so he got a sense of what was happening. "You were watching this horror scene unfolding in front of you and then it just became clear the scale of what it was. A father can't shelter three children of his from averting their gaze and it's like a car-crash, you can't help but watch it unfold. "The shock kicked in at that point." "Honestly when we kicked-off I cannot remember anything happening until the referee came over to me as captain and said 'something's going on behind the goal, we need to get the players off the pitch'. "Everyone thought it was crowd violence behind the goal. We were told to go into the dressing room and stay there, but then the door opened or the door was left open and there was a lad brought past. "That was the only thing we heard, nobody came in or I can't remember anybody coming in and saying 'there's loads of people dying' or 'there's something happening behind the goal'. It was waiting and waiting and the likes of Ronnie Moran going 'keep yourself warm, we'll be going back out'. "Then it was going on longer and longer and in the end someone said the game was called off, there had been fatalities behind the goal. "Really it wasn't until we went up into the players' lounge and met our wives and girlfriends who were crying and it was coming on television. Then there was the realisation then that something had gone seriously wrong. "We travelled back to Liverpool after that, and there was nobody talking on the bus. If they were it was extremely quiet, the bus was a very, very quiet place on the way back to Anfield and then it was just go your own way." "I went down afterwards and I couldn't believe quite what I'd seen. I went down to look at the terrace. The ground was empty now and everybody had gone, it would be sealed off these days if something like that had happened but it wasn't. "There it was, where all these people had died. There were little bits of evidence that a football crowd had been there in the sense that there were bits and pieces lying around, but it was just awful. There were twisted barriers where the crush had bent them over and there was an awful sense of something in the air, you just knew something horrible had happened. "RTÉ News wanted stuff, which we did of course, and I remember we then drove the car back and David and I just sat in silence, reflecting on the fact that we were taking this route back where 96 people who had taken that route with us in the morning weren't going back. "I had done a piece for the (radio) news which we could pick up in the car and David put it on. I remember Emer O'Kelly was reading the news when my piece came on and the line in that which has never left me referred to 'a simple error in crowd control'. "It was obvious to an uninvolved observer what had happened and it's taken all this time and all these inquiries to reach a verdict or opinion which was blatantly obvious to anyone looking at it on the day. "In my inexperience as a news reporter I had put a number of casualties in the report, which they had to snip out because it had grown so much between me recording it and it being transmitted." "We were advised that we could leave and it was a very, very sombre atmosphere. My dad, who was a very passive man, absolutely let rip at a policeman on a horse because it was clear to him what had happened and obviously scary for him with his children there. "So out of fright and whatever else, he let a roar at the policeman, 'you've done this'. "The man on the horseback had no answer to it, he knew. It's pretty clear that he knew and dad wasn't doing it to lay-in to try to be a hero, it was just I suppose the shock and the fear of what had happened. "The public payphones were 50 people deep trying to ring home and confirm they're okay and we're walking up the road and trying to find the meeting place for our bus. "Dad was cognisant, having been at Heysel only five years previously, that we needed to check in and let my mam know that we're fine and we're together. "We were going up the road and dad was knocking on doors. He went up this big long drive way and we were told to wait at the end of the garden and he went in and it actually turned out it was a brothel. But the very nice lady there was wearing an outfit that you wouldn't expect of a Saturday afternoon. "But he was very grateful to get the chance to ring in and that was a relief. "It was very sombre journey up to Glasgow and on the 9pm news it was pretty clear that people were dying and people had died and obviously as day by day went, the count rose. "I can remember certain aspects as if it happened this morning. I can remember the heat, I can remember the red brick of the turnstiles where the initial crush happened. I can obviously remember what happened on the pitch." "Over the next few days we found out how many people had died. I think it was the Monday we all got on the team bus again and went back up to Sheffield to the hospital where all the supporters and injured people were. "There was a lad called Ian Whelan, a Liverpool supporter, I think he was 18 years of age and his nickname was Ronnie. That was when I finally went. "I don't know how I even got in touch with Ian Whelan's family eventually, it was through papers or whatever and eventually I got through to them, but what can you say? "The whole thing of that, after being in the hospital all day and watching what was going on in the hospital with doctors trying to revive people and trying to bring them back out of comas, and then to find out that 18-year-old kid Ian Whelan had died. "They were hard times then. "We all tried to do our bit, we're not counsellors, but we were asked to come back to the ground because the families were there, which was never a problem. "I can only speak for myself but you always felt guilty about the whole thing. There were wives, husbands and kids who had gone to watch you play a football game and they never came home. "I felt a fair bit of guilt because, while you weren't the reason as such, this was what was going on in your head when you're trying to speak to the bereaved families. That was my feeling at the time, they came to watch us so you feel a bit guilty. "Whatever I and the players were going through though, there were families and people going through a hundred times worse. "I've never been out with a Liverpool player from that era where we've sat down and talked about either Heysel or Hillsborough. It's just something that happened that we were part of. "We were never asked did we want counselling, it was basically 'you're a part it and that's it, you're a footballer and you play football'. "The Cup final was probably the most difficult game I've ever been in, in my life, from the start to the end. "Once we got through the semi-final to the final and we knew Everton were in the final, it was just the most difficult time, nothing but sleepless nights. It was a case of 'we cannot lose this game, we have to win this game'. There was no other way that we could do it. "To be fair to the Everton lads, they'd been great throughout the whole thing but they're playing an FA Cup final, they want to do everything in their power to beat us, which you would expect. You're not going to think the likes of Kevin Sheedy and Peter Reid are going to roll over and just let us win because they want to win an FA Cup. "It was hard on both sides. It didn't come easy that game, it was the most difficult I'd ever played in."